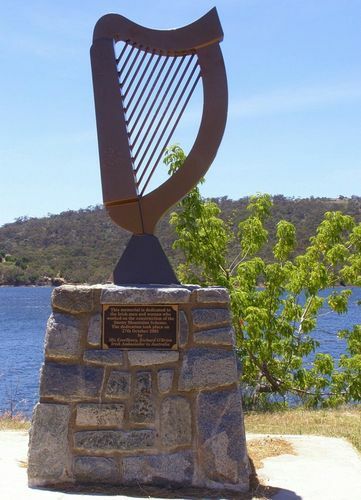 The Harp Memorial is dedicated to the Irish men and women who worked on the Snowy Mountains Scheme. When the Snowy Mountains Hydro-electric Authority was established in 1949, there was a serious national shortage of skilled personnel, equipment and construction materials as a legacy of World War II. The Snowy began an intensive recruitment campaign overseas, concentrating in Europe. The Scheme also absorbed many of the migrants who were arriving in Australia in response to the Commonwealth Government's Immigration Scheme in the post-war years. Overall, 100,000 people worked on the Scheme's construction between 1949 and 1974 two-thirds of them migrant workers. The workforce reached a peak of 7,300 in 1959. Workers from over 30 countries including Australia, Austria, Finland, Jordan, Russia, USA, Ireland, Scotland, Wales, England, Germany, Norway, Sweden, Cyprus, Czechoslovakia, Hungary, Poland, Switzerland, Turkey, Estonia, France, Portugal, Italy, Greece, Rumania and The Ukraine worked on the Scheme through planning and construction.